Just as Delta is committed to hiring and supporting veterans, Stacy Pearsall is committed to telling their stories. On Thursday, the renowned combat photographer and owner of the Veterans Portrait Project came to the Delta campus in Atlanta to share her own journey and continue her mission of connecting with veterans nationwide. After serving in the military for 10 years — six years as a combat photographer — Pearsall found her calling through capturing images of her fellow service men and women. She’s the only woman to be named twice as the National Press Photographers Association Military Photographer of the Year. 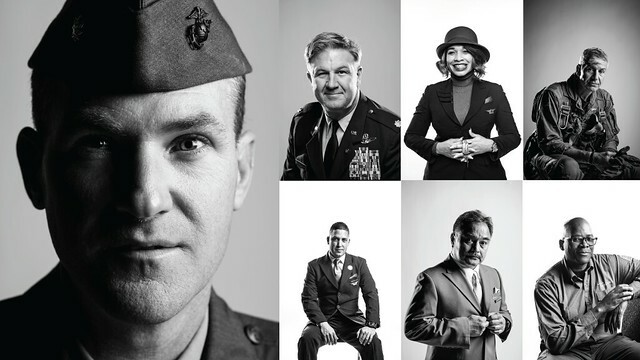 For her Veterans Portrait Project, a full-time endeavor, Pearsall has photographed more than 6,000 veterans in 27 states so far, and hopes to be able to photograph vets in all 50. Her portraits are on display in museums across the U.S., and thanks to sponsorships by Delta and The Home Depot Foundation, are now featured in Atlanta’s Woodruff Arts Center. On Friday and Saturday, she photographed several Delta veterans at the Woodruff Arts Center for the project. Pearsall this week spoke with Delta employees about her experiences and in the evening presented a public program at the Rich Theatre at the Arts Center. In a stunning visual presentation featuring her photos spanning her career, Pearsall discussed how she found her way into the Air Force, across countries and in war zones. Her own military career was halted by a traumatic brain injury she suffered in a field explosion in Iraq. Pearsall discussed both her career successes and personal difficulties in coping with emotional and physical challenges, and she addressed veterans who may share in those struggles. “If you need help, don’t be afraid to ask for it,” said Pearsall. Audiences were captivated by her story, her humor and her charming support dog, Charlie, finding a sense of solidarity and understanding in Pearsall.